Happy Hour All Night ... Every Sunday (except special days/events). 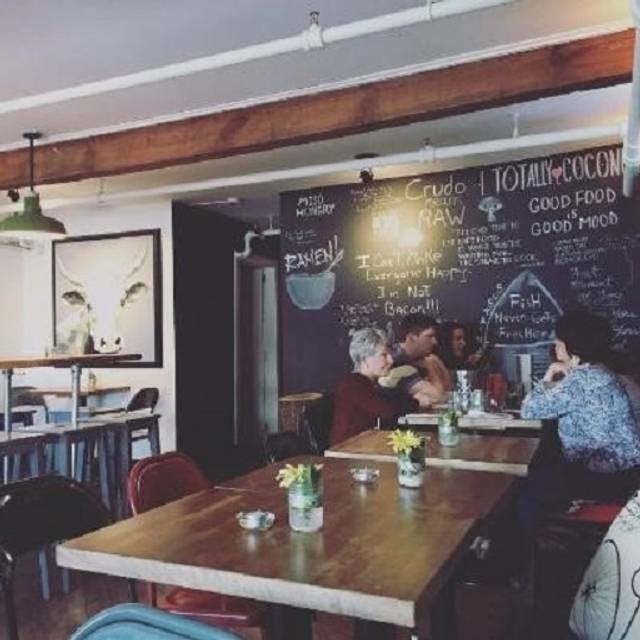 You'll find the locals at Studio East enjoying craft beer, an urban space in the bustling North End Halifax. 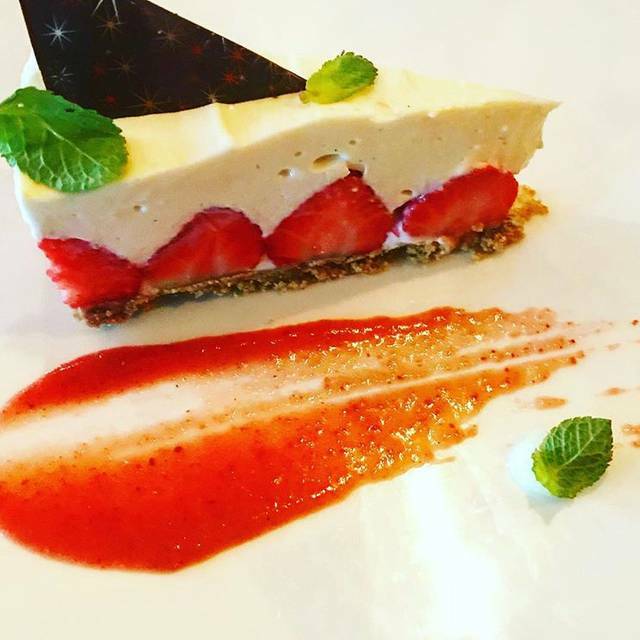 Casual but exquisitely crafted food. Imagination rules. A spinning globe of a menu. 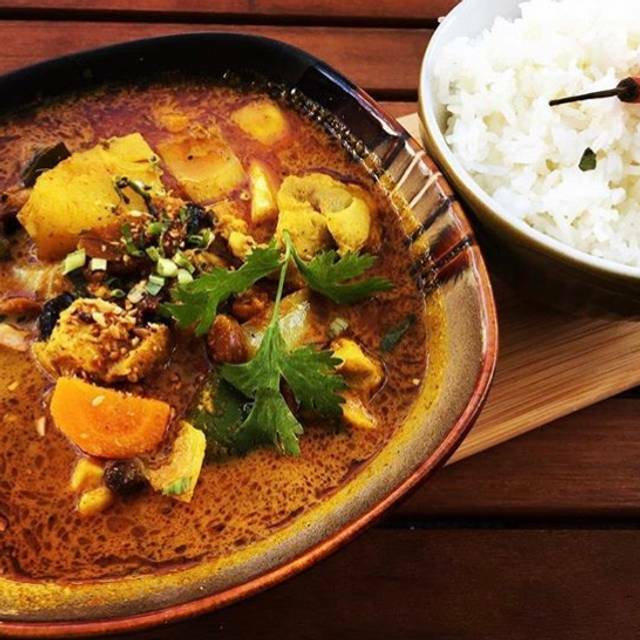 Cambodian Love Curry. Pad Thai Wings. The Ultimate Pork Ramen. Love The Burger. Rice Bowl. 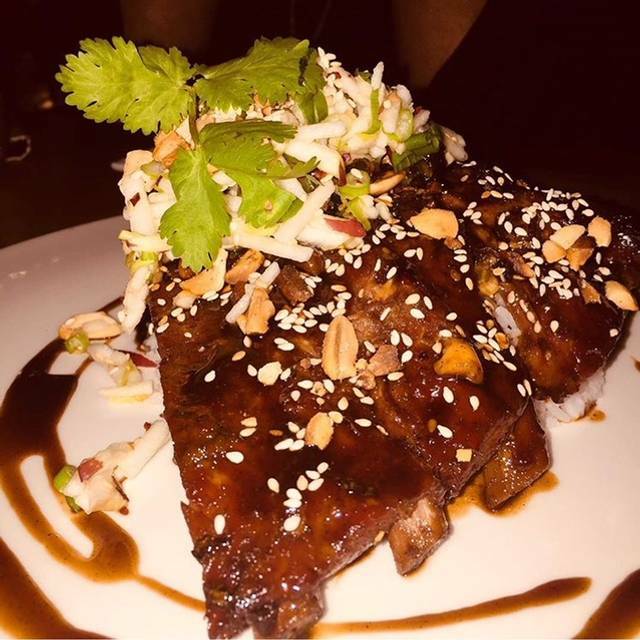 Fermented Ribs. The vision of a locally sourced, globally ambitious restaurant is balanced by the depth of experience that these two chefs bring to the table. Chefs Ray Bear and Saronn Pov are food explorers and pioneers. 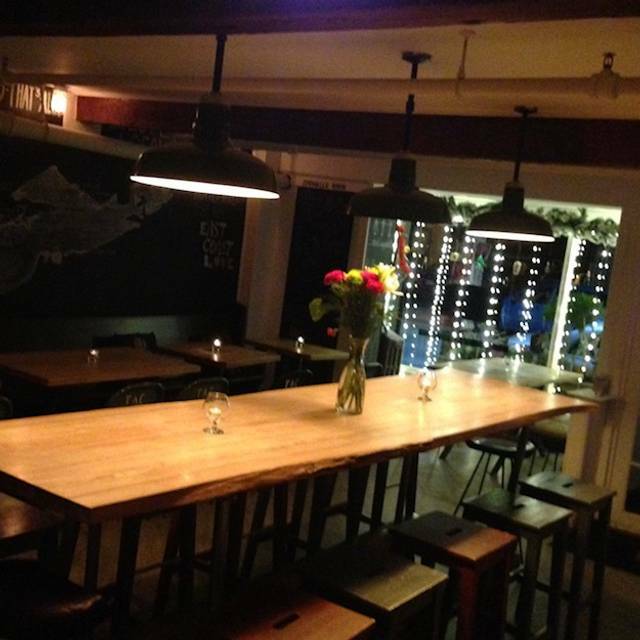 They have brought Halifax the best of global cuisine that is fun and unpretentious. Did you know in spring of 2018 Ray and Saronn started a 212 acre farm to raise and grow our own food for the restaurant? Follow our farm at Kisik Ridge Estate ( @KisikRidge ) to become a part our farm-to-table adventures! We're working hard to develop Studio East blueprint for sustainability. Exciting times! Featuring our Mangalitsa pork a.k.a The Kobe Beef of Pork, raised by our very own farm Kisik Ridge. The Mangalitsa Burger is available March 22 to April 3. Kisik Ridge Free range Mangalitsa pork grilled over charcoal to order, lemongrass, free range local chicken pate, crispy bacon, cheddar and mozzarella, local daikon slaw, fresh local apple, gochujang mayo, fresh Thai basil, cilantro. Banh Mi inspired flavours. Asian-fusion to a whole new level. For every burger sold $1 goes to Feed Nova Scotia. Available for dine-in or order online for pick up / delivery on our website. Not gluten-free. Book now for your large group dinner and receive $100 eGift card bonus. Booking valid on Tuesday, Wednesday, Thursday and Sunday of 12 guests +. Promotion not applicable on New Year's Eve. E-mail reserve@studioeastfood.ca for more info. I don't know if I'm being credited with all my open table reservations. Hope I am. I love this restaurant , the food is unbelievable and I find myself having cravings for menu items. My first trip to Studio East was great. This trip was not as good. I will go one more time to see if this was just a blip. My resevation was for a tegular table but we got a high table with stools. My Ramen bowl was a bit bland and uninspired. My friend’s fish tacos were good but not great. Our server was nice and efficient. My friend and I had to get up and move our table ourselves because where they had positioned it meant I kept hitting my head on the lamp. Again, this time was alright but not nearly as good as the first time. 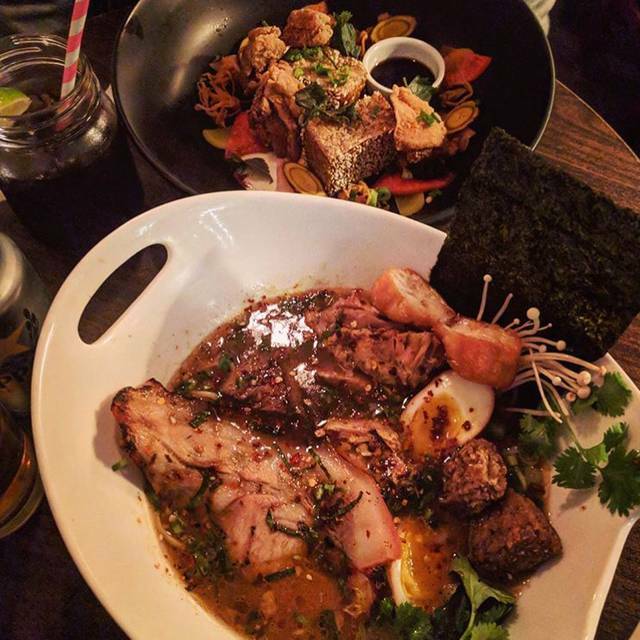 I've been here a few times over the last few years and usually order the pork ramen bowl -- which I have enjoyed many times at Studio East. Though, having recently gone here, I ordered the same pork ramen bowl -- the "ultimate" size, as usual -- and noticed the portions were significantly smaller and was not worth the price ($18.95). The giant bowl only had two (!) spoonfuls of noodles, very little vegetables, and two very small, one-bite sized pieces of meat. When I got the bowl, it was full of soup, but you could not even slightly see the contents in the bowl because it seemed like all the soup was masking the food that was not in there -- it lacked plating. I have also ordered this to-go before, and have gotten way more meat/contents. The portions are inconsistent. Additionally, I usually order this item gluten-free (so it comes with rice noodles -- the most economical/affordable noodles out there in-store). I addressed the portion with the server and she said that because the dish is GF, the portions are usually smaller... which is 1) not the greatest response and 2) seems unfair if that's the case. As someone who can't eat gluten, I so often have to pay MORE to have my dish modified or have food items subtracted from the dish, without having these items be supplemented for. A better business plan would be to compensate for subtracting gluten-items. They gave me a 25% discount for dissatisfaction, which was nice of the staff, but the dish, as it was, was still not worth the discounted price. I was an advocate of this restaurant before, but now I am no longer a fan and will not be returning. The food, as always, was spectacular. But the service was subpar. I don’t mind waiting when it’s busy, but we sat at our table for half an hour before our waitress came to take our drink order. Other staff members asked us how our food was and refilled our drinks, and then she would come around to ask if we needed anything. Awesome food, as always. Staff are friendly, service is fast. 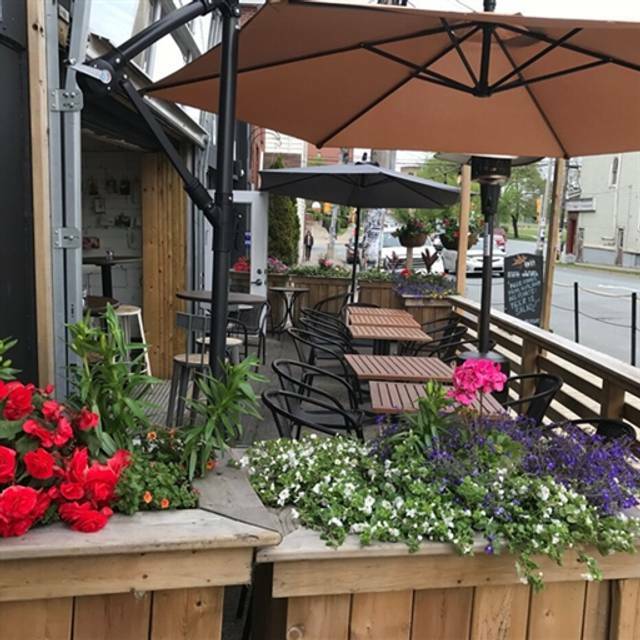 It's a good relaxed spot in the north end , with good food. Have heard great reviews from other guests of this restaurant and we love to try new spots in the city. We were disappointed. Ordered an app that never came. Dry burger, salty dumplings.... hoping this was just a one off and the previous reviews were correct. The service was almost too efficient as funny as that sounds, almost felt as if were were being pushed out (there was no wait to indicate that the table was needed.) We won’t be heading back anytime soon. The Japanese fried chicken was awesome!! Always a great time whenever we’re there. Atmosphere is always amazing! It was our first visit to Studio East. We will certainly be back. Our table was ready at the time we had reserved it. The service was excellent. The atmosphere was wonderful. Studio East had a real positive buzz and, while on the slightly noisy side, it was not so loud as to limit conversation in any way. The lighting fit the ambiance but it was dim enough that it did inhibit our ability to easily and fully appreciate the presentation of our meals in their bowls. It did appear that presentation was important and was first rate. The food itself was superb. The non-drinker of us did suggest that such an excellent restaurant, that prides itself on being local, should have some local kombucha on tap or at least available in bottles. Lime daiquiris were amazing and made me think of somewhere warm ☀️. My curried haddock bowl was delicious. Our server incredibly attentive, great evening. Love studio east, food is incredible. One and only gripe. Servers sometimes dont have change. Makes tipping when you have cash hard. everything about the meal and service were wonderful. only complaint was window was cold in the winter - both people who were next to the window had to keep their coats on during the evening. regardless we'd go back and recommend it for sure! Good variety of food. Service was slow and food came out a little cold. AMAZING food. Service was slow as there was not a great customer to wait staff ratio but we were still well taken care of despite this. Well worth the money. 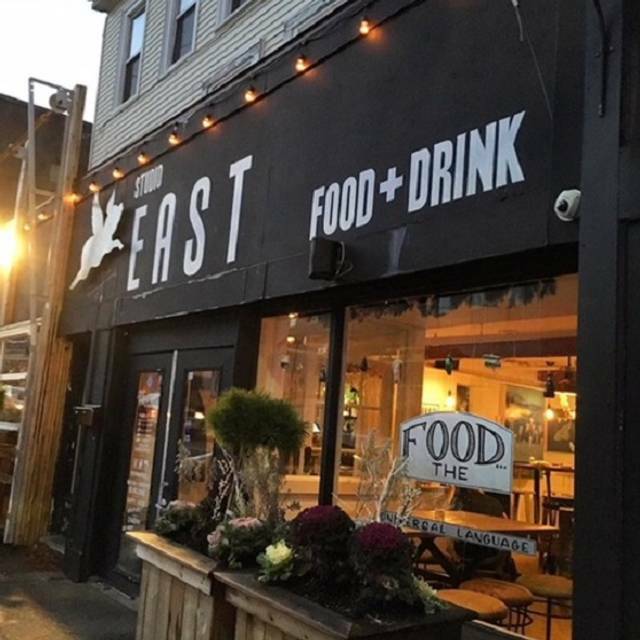 Studio East offered an eclectic and fun atmosphere. Despite it being packed the service was excellent. They quickly accommodated a seating change and were efficient. The food was delicious and arrived in a timely way. I’ll definitely be back again. Thanks! Food and presentation was superb. Service great too. Only criticism is that the mocktails, although tasted great , were HIGHLY overpriced. Will stick to water or pop next time. It’s typically noisy for a small, busy restaurant, but not excessively. Waiter was a bit hard to hear, but he spoke very softly. Needs a bit of a speaking lesson. Food is excellent. I had the Ramen bowl and every bite was different and amazing. I would highly recommend this restaurant. The food is always excellent here and unique. Our only complaint was the uncomfortable chairs. They look cool, but are not great to sit on for any length of time. Very noisy. Cocktails were ok, however there are better ones around Halifax. Good value when it come to the food. Great prices. Flavour were so-so. Went next door to Elliott & Vine for cocktails and tapas. Dined here on Valentine’s Day, it was very busy but that was expected. The service was great even though the dining room was slammed. We were very impressed. The food was outstanding, will return to try other menu options. Would recommend! Food was awesome. Noise level a little high and metal chairs were a bit uncomfortable. 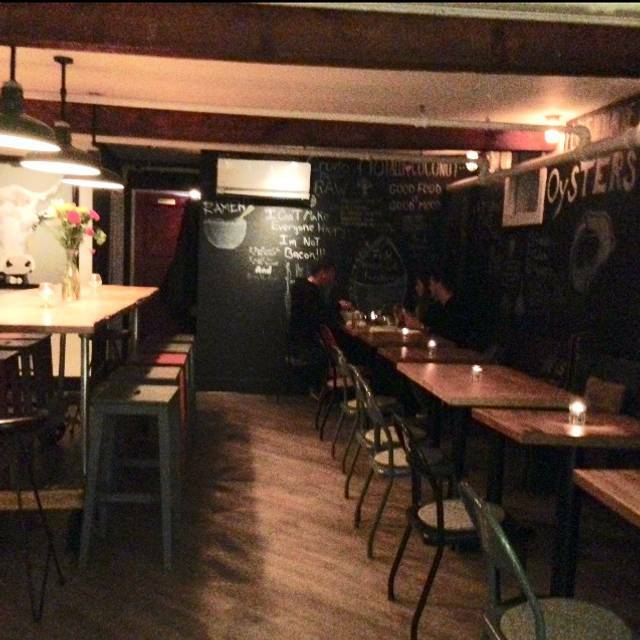 Studio East is one of our favourite restaurants in Halifax. Excellent and creative food at very reasonable prices. Add in good service, interesting cocktails and local beers and you have a great destination for any occasion. We enjoyed our meal, the cocktails were tasty and the mains were very good. Portions sizes were excellent. We sat by the window which was a bit drafty for my mother - but it was a windy cold night, nothing anyone could have done have done about the weather. The only part of the night that left a little to be desired was the dessert. After our mains (between us we had the ribs, karaage, ramen and tacos) all knocked it out of the part, the desert was a little disappointing. Not bad, just didn't measure up to the mains. Enjoyed dinner with friends on Saturday past. We had evening plans so we eat early. This is a wonderful gem of a restaurant. Food was top notch and the relaxed atmosphere is welcoming. Place fills up quickly so reservations highly recommended. Throwback music can be nice, if chosen wisely. Early Nikki Minaj and top 40s did not fit the ambiance. We were disappointed this time. We have eaten before. The pork in the ramen noodles was very dried out and tasteless. The wings were also disappointing. It was our first visit to Studio East. The food was fantastic, all kinds of different flavors with every bite. The staff were very friendly and out going. We will definitely be back again. Sat quickly and served quickly. Food is always great and it is a fun environment! We went here for our anniversary . It was pleasant from entering to seating. The service was top notch and the menu local and inspired. As vegetarians there were many options. We lucked in on happy hour and enjoyed a lovely glass of wine at half the price. The food and staff will make this a repeat destination.